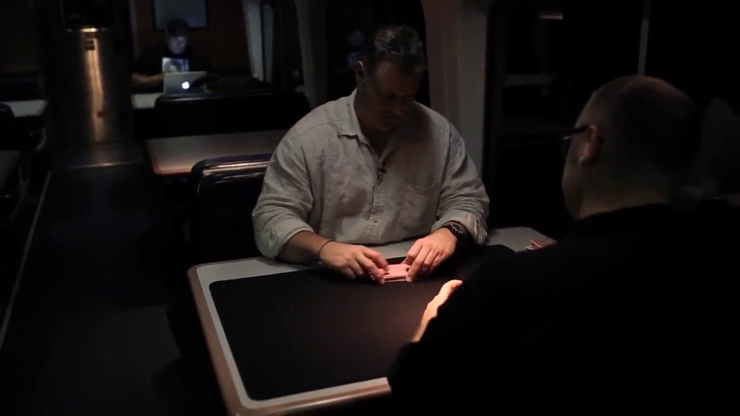 The Unreal Work 2: Cheaters on a Train reveals more powerful methods for cheating at cards. Learn thirteen professional routines guaranteed to fool and fascinate your audience. Paul and Jason share secrets from their personal repertoires, drawing from decades of study into the world of crooked gambling. From devastating false shuffles, slug controls and false deals to baffling feats of skill and fascinating exposes, The Unreal Work 2 is an unmissable toolbox filled with material for anyone interested in gambling sleight of hand or card magic. 1. Aces To Order: Shuffle the deck and dead-cut to any ace called for. 2. Getting Burned: whether you play Texas Hold 'Em or just watched it on TV, this proves that if the dealer is a crook, you don't stand a chance. 3. Bad Beat: dealing hands and making choices still doesn't mean the game is fair. Sometimes it's more than the odds that are against you. 4. Cut Up And Deal: Four aces are separated in the deck. 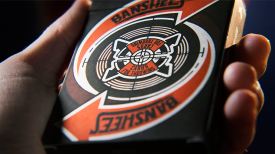 You cut cut each one then stack them to any selected hand in just one shuffle. 5. Gambling Demo: Jason has performed the Marlo/Gardner Poker deal for twenty years. Here he reveals his personal method for this unbeatable classic. 6. Seconds And Thirds: First you explain the concept, then you deal a perfect hand of 21 that starts on top of the deck. 7. Hold Em Deal: A staggering display of apparent skill made nearly self-working through clever routining. 8. Hybrid Shuffle: Paul combines multiple subtleties to create a remarkable variation on the Zarrow shuffle. 9. WCS: Paul dribbles two halves of the deck into one messy pile. The deck remains in it's original order. 10. Tips On The Second Deal: A lesson for beginners and those who want to correct their technique. Jason reveals the best way to learn and develop a feel for this powerful sleight. 11. Thanks 2 40: Deal any number of hands from a shuffled deck. Pick up those cards and immediately deal a killer hand. The spectator can even name the number of players. Includes Paul Wilson's strike bottom deal. 12. Slug Control: Jason has adapted a real-world cheating technique into a powerful control for card magic. 13. Deep Breather: Paul's secret method for making a permanent breather crimp that is invisible on any card. X no longer marks the spot if you need strong work in your deck. The Unreal Work 2 features thirteen powerful ideas for anyone interested in card technique. Simply enter your details below and we will send you an e-mail when “The Unreal DVD by Paul Wilson and Jason England - DVD” is available to ship!